This week we examine a new class of ship that is presenting itself – the “99,000-tonner.” Not a mega ship, but still larger than we are used to, these new ships seem to offer a prospect of trying to fill a gap in the quality end of the premium cruise market. Elsewhere, while Silversea has not said anything, news has leaked from China about a potential €800 million financing deal for three new ships to be built by Fincantieri. And in a continuation of this “Marco Polo” theme, Carnival Corp & plc has announced an agreement with China State Shipbuilding Corporation to design the optimum cruise ship for China, an agreement to which Fincantieri might also become a party. As Holland America Line announced the name Koningsdam for its new flagship, TUI Cruises placed into operation the first of it’s 99,000-tonners. Interestingly, the new TUI ship immediately picked up the Berlitz Cruising & Cruise Ships prize for the top-rated large cruise ship in the world. In this, Mein Schiff 3 surpassed any Holland America ship by a handy margin. It will be a couple of years yet before we know whether the new Holland America flagship has a chance at taking the prize over the likes of Cunard and Celebrity, and now TUI Cruises. But what is interesting about these new TUI and Holland America designs is that 99,000 tons is an unusual size for a cruise ship these days. Most new premium market cruise ships are in the range of 140-170,000 tons and carry 4,000 passengers. 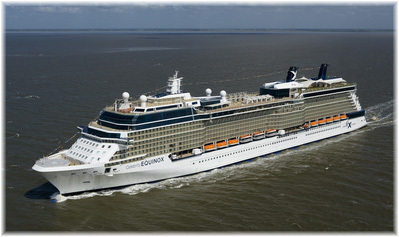 Even Celebrity’s Solstice class ships, which have 2,850 lower berths, come in at almost 122,000 tons. Now we have two new classes of ship that come in at 99,000 tons. The first of these ships is TUI Cruises’ Mein Schiff 3, of which a series of four is planned between now and 2017. Among other features, Mein Schiff 3 features a concert hall, as well as a maritime museum and shop selling nautical artefacts. She has eleven restaurants with traditional, Mediterranean, Asian, Japanese and seafood menus plus a 24-hour bistro. 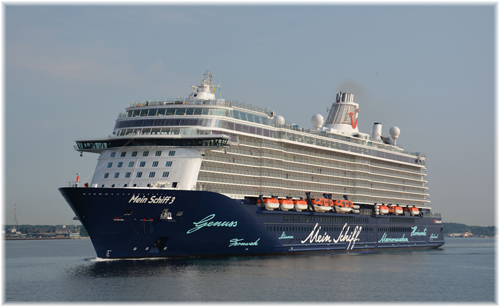 In many ways, Mein Schiff 3 also has similarities to Celebrity’s larger Solstice class ships, which were built in Germany for a sister company. The buffet area on Mein Schiff 3 is named Anckelmannsplatz, after the square where TUI Cruises and Hapag-Lloyd Cruises both have their headquarters. As on the Solstice class ships, many different stations serve the buffet restaurant, thus cutting waiting times. And as on the Solstice class ships, the extra-tariff restaurants are all located aft on deck 5. These consist of a steakhouse and a gourmet à la carte restaurant, as well as a midships bar. While the majority of the ship is all-inclusive, the restaurants and bars in the stern are extra-charge. The second 99,000-tonner is Holland America Line’s new Pinnacle class flagship, the Koningsdam. New York-based hotel and restaurant designer Adam Tihany has been hired to work on the ship, along with famed maritime designer and architect Bjorn Storbraaten, who also worked on the Eurodam and Nieuw Amsterdam. Tihany has also been commissioned to create the indoor and outdoor areas for sister line Seabourn’s new 604-berth ship, which is also being built by Fincantieri and due to enter service in 2016. Just as TUI Cruises and Hapag-Lloyd are both based in the same building in Hamburg, so Holland America Line and Seabourn are both based in the same building in Seattle. Several new concepts are under study for the new Holland America ship but as of yet none have been revealed. The largest ship ever built for Holland America will provide several new public spaces, as well as features already familiar on other units of the fleet. 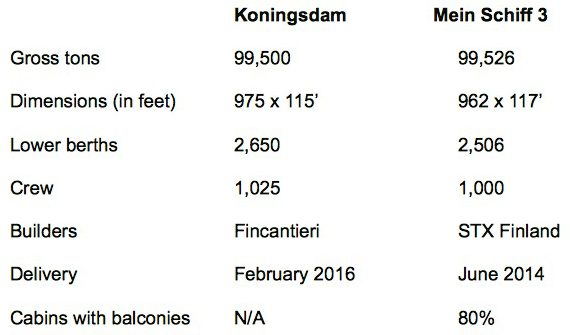 One criticism of the Koningsdam is that her promenade deck will not be walk-around, which has been a trademark of all Holland America ships to date. Another is that she is stacked up heavily forward, looking like one of the latest Carnival ships. But there is no doubt that keeping her tonnage below 100,000 tons, as well as the engagement of interior designers who have expertise with ultra-luxury products (Tihany lists restaurants at both the Cipriani Hotel in Venice and the Breakers in Palm Beach among his credits) are both intended to keep the new ship in the more upmarket category. One result of these decisions is that Koningsdam is a break with the past in another way. Despite the Rotterdam now being based full-time in her namesake port and despite Holland America ships operating under Dutch flag, Koningsdam she will be the first Holland America ship not to employ Netherlands-based interior designers. While most of the new ship’s features will be based on the 2,104-berth Signature class vessels Eurodam and Nieuw Amsterdam, the Koningsdam is reportedly based on the platform of the 92,720-ton Costa Luminosa class, also by Fincantieri. The hull has been lengthened and widened, two decks added forward, the lifeboats lowered and the atrium eliminated from the original design, while it appears that the Tamarind Restaurant will be relocated to a position aft on the Pinnacle class from the forward position it has on the present ships. Compared to the Signature class, the new class will contain 15% more volume but carry 25% more passengers, meaning they will have a passenger space ratio of 37.5 tons per passenger compared to 41.6 on the Signature class (and 39.7 on the new TUI ships). The other half of TUI Cruises is owned by Royal Caribbean Cruises, whose subsidiary Celebrity Cruises supplied the German line’s first two ships, Mein Schiff 1 (ex-Galaxy) and Mein Schiff 2 (ex-Mercury) and continues to supply safety management for all the TUI Cruises fleet. Unlike Koningsdam, Mein Schiff 3 includes a full walk-around promenade deck on deck 5 (although there are steps up to the bow area). And where Holland America was amongst the first to offer for-rent cabanas on deck, TUI Cruises has taken this further by introducing new “Sky and Sea” suites that include a private staircase up to a private cabana above. The ship also has the longest swimming pool afloat, at 82 feet in length. In terms of cruise ship ratings, the 2015 Berlitz Cruising & Cruise Ships guide gives Mein Schiff 3 the prize as the world’s top-rated large ship, with four-star-plus and a score of 1696 out of 2000. The three Cunard Queens followed, while Celebrity Reflection came next with four-stars-plus and 1569 points out of 2000 – Celebrity Equinox, Silhouette and Solstice had similar scores. Further down the list, Eurodam and Nieuw Amsterdam scored four-stars and 1448 and 1436 points respectively out of 2000. One big difference between the Mein Schiff and Koningsdam designs is that there is only one forward-facing public space on Mein Schiff 3, the Sky and Sea Lounge on deck 12, and this will become an integral part of the spa on Mein Schiff 4. Otherwise, forward-facing areas on the new TUI ships have been reserved for the occupants of the suites and mini-suites. Although no deck plans have been released for the Koningsdam, it is expected that she will retain the forward-facing Crow’s-nest Lounge arrangement that currently exists on the Signature class as well as other ships of the Holland America Line. Last week, Shanghai-based ICBC Leasing, the leasing arm of state-run Industrial and Commercial Bank of China, announced that it had signed with Monte Carlo-based Silversea Cruises for the financing of three cruise ships to be built by Fincantieri in Italy. This would be the first major financing project for a Chinese financial institution in the global cruise industry. This development follows the agreement made in January 2013 whereby ICBC took over lease financing for Silversea’s 388-berth 2000-built Silver Shadow. 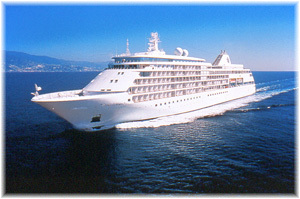 Financial details were not released at the time, but the Silver Shadow is now owned by Hai Xing 1201 Ltd and leased back to Silversea. The number of ships owned or managed by ICBC Leasing at the time of this announcement was almost 200, mainly cargo ships but now also cruise ships. Total value of the latest three-ship deal is expected to be about €800 million, or just below €270 million per ship. ICBC Leasing said the signing of the deal marks a milestone in the company’s business and will help strengthen its presence in the international market. As is often the way of such things in China, the breaking of this news was probably premature from Silversea’s point of view, as no announcement has been forthcoming from Monte Carlo as to how the new facility will be used. It could mean that, like Seabourn, who are in the process of selling off their original trio of 212-berth ships to Windstar, Silversea may be planning to replace its 296-berth Silver Cloud and Silver Wind, which will soon both be twenty years old. 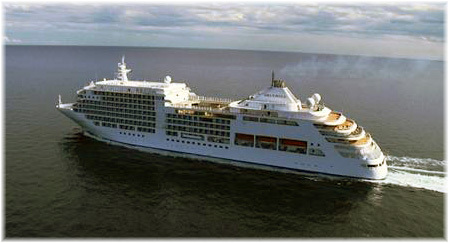 The 540-berth Silver Spirit and Seabourn’s 450-berth trio of Odyssey class ships, all built by Fincantieri in 2009-11, each reportedly at a cost of about $250 million. It could also mean that Silversea may want to upgrade part of its fleet of three expedition ships, all of which will soon be twenty-five years old. In this regard, Miami-based Sunstone Ships has been working for several years on a project to build eight new 200-berth expedition ships at a newbuidling cost below $100 million per ship. Compagnie du Ponant have meanwhile built four slightly larger ships at a reported cost of about $100 million each, all completed again by Fincantieri, between 2010 and this year. Based on the amount put forward it would seem that three cruise ships could be likely, either of a new design or as a development of the Silver Spirit, the sole ship of her class despite earlier discussions of possible sister ships. But it is also possible that Silversea might consider two new cruise ships, and one expedition ship, an area where Silversea is believed to have made some good returns in recent years. The Silversea news came a week after news that Carnival Corp & plc and the China State Shipbuilding Corporation (CSSC) had signed a Memorandum of Understanding, to which Fincantieri could become a third party, to design a new cruise ship for the China market. Carnival said it would provide ship design and shipbuilding expertise to help create and define the overall specifications for the China-built cruise ship. It said the agreement also included other opportunities, such as the formation of a possible joint venture domestic cruise company aimed at accelerating the development and growth of the Chinese cruise industry. CSSC is one of China’s top two state-owned shipbuilding firms and has shares listed on the Shanghai Stock Exchange through subsidiary China CSSC Holdings. But Chinese experience with building passenger ships has been limited to ferries and cargo-passenger ships and they would be starting from scratch with cruise ships. 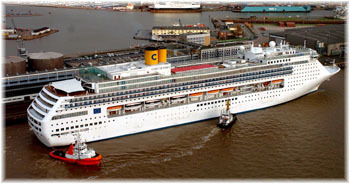 Carnival has been developing the Chinese market since 2006, when it sent Costa Cruises’ 810-berth Costa Allegra to cruise there, followed later by the 1,928-berth Costa Victoria. It has since added further tonnage, and will soon add the 3,000-berth Costa Serena, which will be based year-round in China from 2015. In addition, Princess Cruises, while concentrating on the Japanese market, where its 2,700-berth Diamond Princess and Sapphire Princess were built in 2004, has also opened five offices in China. 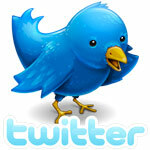 Carnival also recently announced that it would be basing its chief operating officer, Alan Buckelew, in Shanghai. Buckelew was ceo of Princess Cruises when Princess opened its new China offices and has now replaced former Costa Cruises ceo Pier Luigi Foschi as Carnival’s top executive in China. 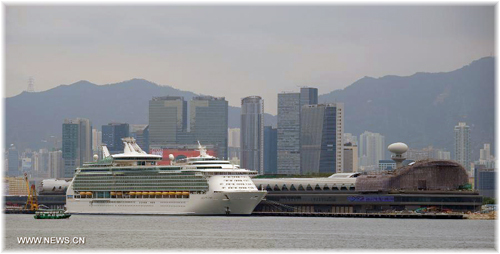 Meanwhile, Royal Caribbean Cruises has been basing two of its 3,114-berth Voyager class ships, Voyager of the Seas and Mariner of the Seas, in China on a seasonal basis since 2012. And in 2015, after a six-month season in New York, it will be sending its newest ship the 4,180-berth Quantum of the Seas, to be based in Shanghai year-round. Royal Caribbean has also sold its 1,814-berth Celebrity Century to China’s Ctrip travel agency, with which it is also considering developing a new domestic cruising joint venture. By 2017 it is estimated that the Chinese cruise market could be the second largest in the world, rising to 4.5 million cruisers a year by 2020, and outdoing both the UK and Germany. Arnold Donald, ceo of Carnival Corp & plc, has gone as far as forecasting that the Chinese cruise market will one day be the world’s largest, even larger than the United States, which presently produces 14 million cruisers annually. Overall, however, in view of the differing lengths of cruises booked by different nationalities, it would make more sense make these comparison in terms of the number of cruise nights booked rather than the number of cruises. The average cruise length in China is more likely to come in at around 5 days, compared to almost twice that amount of time in Europe.